Relying on snowmobiles, Sámi herders must wait for the season’s first snows before rounding up reindeer herds from their summer pastures. Travel is also difficult if the snow cover is thin. The Sámi, who live in Scandinavia and Russia’s Kola Peninsula, manage reindeer in herds. Reindeer serve the Sámi as a source of wealth, much like savings accounts. But recently, reindeer herding has become more difficult. Lakes, rivers, and bogs freeze much later in autumn, making it harder to collect the herd from its summer pasture. Migration patterns have also changed, disrupting traditional herding and slaughtering schedules for the Sámi and other herding groups. 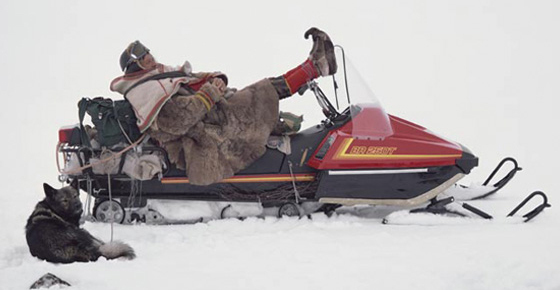 The Sámi and their ancestors have lived in the Arctic for thousands of years. Historically, Sámi territory was much larger, until farmers displaced them in the 1300s.